Aventura de 3 horas desde Cancún. Curso de tirolesa por la selva. 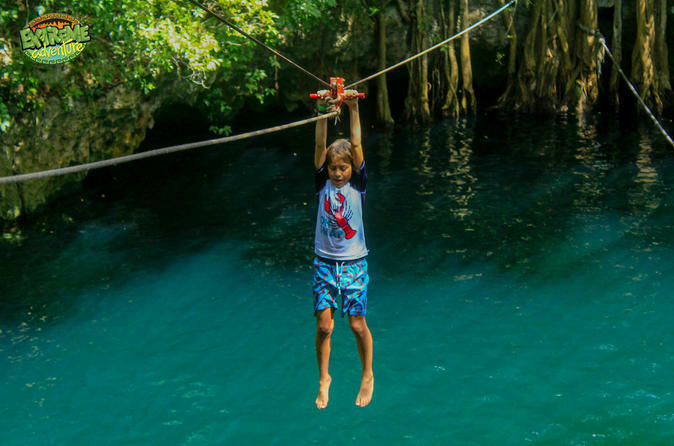 Comience con la recogida en su hotel de Cancún o Riviera Maya y, a continuación, viaje al Parque Ecológico Extreme Adventure, donde comenzará su experiencia en la selva. Comience pasando por encima de los árboles en una serie de seis tirolinas y, a continuación, cruce tres puentes interactivos que pondrán a prueba su equilibrio mientras le ofrecen una vista única de las copas de los árboles. Regrese al suelo y cambie su arnés para la tirolina por un todoterreno Honda 220cc y, a continuación, siga a un guía por los escarpados senderos de la selva, saltando rocas y raíces, rodeados de un denso bosque. Termine el día al estilo del Yucatán refrescándose en un cenote: podrá lanzarse en tirolina, saltar o bajar por las escaleras hasta la piscina subterránea, que es parte de un enorme sistema de cuevas de piedra caliza talladas por el agua dulce. Regrese a la base para reponer energías con un aperitivo ligero (tendrá disponibles fotos del día por si desea comprarlas) y, a continuación, haga el viaje de regreso a Cancún y la Riviera Maya, donde termina el recorrido. The crew made it worth while especially Alex and his team. 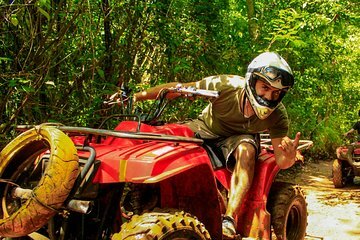 My husband has never done Atv or ziplining and had so much fun. The tacos at the end were so yummy too but bring snacks because the excursion is about a few hours depending on how much people are there.The cenote was absolutely beautiful but my husband and I didnt swim which we regret so much. Overall really nice experience. It was very action packed and the food at the end was totally amazing some of the best food I had in Mexico. Safe, exciting, well organized. This tour was fantastic. Thanks so much to all the guides for such a great day! Definitely recommend this tour! We had a blast . Well organized and fun team. Our instructor was Reno and we give him double thumbs up 👍🏽. He helped my sister who was really afraid of heights and was her first time with Zipline. Also photographer took really nice pictures. Only thing is I lost my special hat while atv riding . Hoping they find it . Very fun experience, the guys who work there are funny and very personable. The ziplines were just the right level of difficulty for a beginner. The only complaint I have is that the website description said 6 ziplines and 3 bridges, but there were only 4 lines and 2 bridges. Also, I would recommend that you bring goggles or some sort of glasses for the ATV, it gets very dusty in your eyes. Lastly, there is a $10 or 200 peso deposit for a locker rental, which was a surprise when we got there, so make sure to bring that since they don't tell you in advance. Overall, though, it was a really fun trip and a great day! They take great care of you! If you are the adventurous type you will love this activity. The staff are amazing and make the experience fun and safe. They provide water from a cooler with cups but also sell bottled water, beer, and cola for 40 pesos each. You can bring a back pack or bag and they will provide you a locker key for a 100 peso deposit (which you get back at the end of the tour if you return the key). Be prepared to get a little muddy and bug spray may be a good idea too due to mosquitos. Overall though I would highly recommend this activity. You won’t be sorry! We had a good time. It was my wife and my 2 boys ages 13 and 15. The boys had fun and was well organized. ATV was extremely rough terrain, but fun. We paid for the photos and loved them. Tacos after the activities were really good as well. Great customer service. Mary and the crew made everything very enjoyable and user friendly. Would definitely do again! loved every minute of it!! they were very organized and scheduled.Angel was hilarious and Ramon was awesome!